tainted with the industrial chemical melamine. tests, leading to higher prices in the market. But the use of melamine has meant that consumers — and their pets — get nutritionally inferior food laced with a deadly chemical. ingredients used to make pet food. melamine-contaminated meat from entering the food supply. which was then sold at supermarkets. What do you think the Chinese feed their livestock? How did the FDA and USDA figure that this pork was safe? More Greed based decisions by our government! Just think, Congress has been making steps to hide the origin of imported foods. They are voting to end the country of origin labeling on meat and poultry sold in the US. Read more here. The more I read the more I am disgusted with our government and why they let this crap into our country. Our government needs to do more to protect us. But until they do, start protecting yourself. Do your research and locate some local farms and start buying locally. Farm to Table is the best way. Wow!! Bad news for the consumer!! It is getting increasingly more important to find a source of farm raised meat. Congress has voted to end the labeling of “country of origin” on almost all meat and poultry. This can’t be a good thing for those that are wanting meat raised in a healthy way. Also, with the government wanting to pass another trade deal to be able to make it easier to trade with Asian countries, that means Chinese meat will now be pushed into our markets without being labeled. Forget all of the warnings about meat and fish raised in China, it will no longer matter because you will not know where it is from. Congress once again shows who it really represents. This country is going down the crapper!! Bypass the attempt to push foreign sub-prime meat onto your plate, buy your meat locally. You know where it was raised, how it was treated, and who processed it. Plus it hasn’t traveled across the earth to get to your table. What are we eating? Is fast food what you think it is? I just read an article about McDonald’s Artisan Chicken Sandwich. McDonald’s is simplifying the ingredients because they realize that their customers want to be able to recognize and pronounce the ingredients in the food they eat. It was the push for higher profits that made their chicken sandwich a target for change in the first place. What can we use that is cheaper, something that we can pass off for real meat? How much can we push the federal guidelines for the allowance of “other stuff” in our meat. How can we convert scraps that we would normally throw away into something the customer would recognize and purchase? The people are waking up to what these big corporations are putting in our food. Wood pulp as filler in the beef. Meat glue used to combine meat particles together to mimic what they used to sell. Meat trimmings left over from the cut room floor, pressed into a familiar shapes and seasoned to taste like what it is representing, is all to popular for these corporations. No wonder why sales are dropping, people will only buy into their farce for so long before they expect better. Have you read the label on packaged frozen chicken breasts in your local supermarket? I did, I found out that what I thought were actual chicken breasts, were actually made from the meat taken from in- between the ribs. This rib meat is then meat glued together into the shape of a chicken breast. It is pretty convincing, I wouldn’t have known until someone told me to look for it. My Grandpa always said that he would never buy a chicken unless it was a whole chicken. He was afraid that parts of the chicken that went bad would be cut away and they would sell the rest of the chicken as parts. He had great vision and knew that people would do anything to retain profit even at the expense of others. A friend of my parents says that he would never buy canned beef. He said it was made from the cow’s bag. Could be true. And they would be right in saying that it is 100% beef. The only thing is, the consumer is expecting actual meat from a muscle group. As long as it can be passed off as something more appealing, the company will have a good chance of making a sale. Selling the cow’s bag would increase the revenue that they can produce from one animal. Back in the day they may have used the cow’s bag as a leather pouch, but unless I am mistaken, I know of no recipes that call for it handed down through my family. I know that back in the day they used all parts of the pig, and would use the squeal if they could. That is being resourceful, and frugal. But I am sure they didn’t hide what was in their stew and call it something that sounded more appealing. And if something “fell” into the meat as they were processing it, they took it back out. Corporations just figure that 2% of “other” non meat stuff is great because they can sell that too. It is sad when you can’t trust what you buy to eat. I think that the only way to truly be able to trust what you are eating is to grow it yourself. The second best way would be to buy from a local farm that raises their animals like you would. This is why I raise my own meat!! Small farm knowledge is disappearing. The small farm way of life was once standard procedure. In the Midwest the landscape use to be dotted with small farms. Fried Chicken was not from colonel Sanders, it was from Grandma’s backyard pluckin. There is a huge disconnect from the small family farm. I believe that with the growing push towards corporate farming, the old school way of life is disappearing. I disagree with corporate farming. Corporations believe that they are the answer to feeding the populous. And their goal is to program that into the next generation and take away their self reliance. Not to mention that corporations are self serving and prefer profits over heath. They feed us antibiotics, growth hormones, and genetically modified products, not because they are healthier for us but because they increase profits. I talked with a college student in Agriculture studies a few weeks back. At her college they are teaching that GMO’s are the only way that we will be able to feed the growing population. And this comes from a very conservative college. Once again that notion that “we have to feed the population” is mainstream. What happened to the population being able to feed itself. Well, a United States Department of Agriculture report revealed that in 1935 there were 6.8 million farms and by 2002 only 2.1 million small farms remained. That is 4.7 million small farms lost. Those small farms that were lost could not only feed themselves and others, but they taught self reliance to their next generation. That individual knowledge of self reliance is not profitable to corporations that want you dependent on them. Luckily, the masses are being slowly re-educated and are wising up to the corporate propaganda. The push for healthy food is helping create a market once again for the small farm. A market that the big corporations can’t tap into. More and more people are choosing to raise their own meat, even chickens in urban backyards are popping up everywhere. I believe that small farms can feed our growing population, but the small farms need to do more education and marketing. If you raise healthy meat but nobody knows it, it won’t sell. Make your farm known. Put up signs, join farmers markets, or put ads on Craigslist. The idea of purchasing from a small farm will catch on, and people will realize that meat doesn’t just come from the big box grocery store. If you don’t have a farm, you can still get involved by supporting your local small farm. Go to the farmer’s market, join a CSA, or put a chicken tractor in your back yard. Find a way to not support the corporations that are counting on you to fill their pockets. 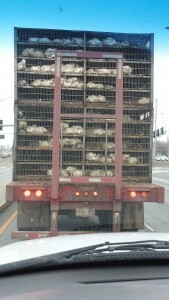 For those that have never seen how a Tyson chicken spends its last few minutes on earth. They go from tightly packed-smelly- poop-filled buildings, to being packed into cages on a semi trailer, to the processing plant . Please support your local farmer! This is why I prefer “small” farm raised chicken. Ossabaw Island Babies are Here! !